As February came and went, I realize that I’ve been in my new community, Piura, for a little over a month now. It’s been an amazing first month filled with a lot of ups and downs as I learn more about my organization’s needs and build my community here. I often think about San Francisco and the beautiful community that I left behind there. I made this video, and I had to watch these beautiful, panoramic shots of my previous city and the faces of my friends no less than a hundred times that I most definitely cried at one point. But they weren’t tears of sadness indicating any level of regret. On the contrary, I cried because I was so happy that we built such an amazing community filled with creativity, compassion, and food. There was lots of food! Growing up in a traditional (or as traditional as possible in America) Filipino household, my siblings and I were taught from a very early age to respect food and were required to eat at the dining table for every meal. At the time, I thought they were silly rules. I didn’t understand why we couldn’t eat while watching our favorite shows or why I had to leave my friend’s house who lived next door to come home and have dinner with my family. However, now that I’m older and living away from family, I find myself missing all of those meals at the table surrounded by people I love. Sometime in 2018, after I got over the shame of my small, San Franciscan apartment and my fear of judgement from my friends (because I didn’t have a dining table), I started hosting neighborhood dinners on Sundays. It started weekly and focused on people who lived in close proximity to me. Why? I’m not sure. Maybe it was a simple craving to know my neighbors. Maybe it’s some kind of nostalgia for the past I never really knew but had briefly tasted while growing up in a small town in New Jersey or during my summers in my parents’ communities in the Philippines. Maybe because there is a certain level of magic when you live in close proximity to your friends and you don’t need to spend money on cab fare. Or maybe because there’s a certain level of magic on Divisadero Street, where I lived in San Francisco. As much as I wanted to have homey meals with a local community, maybe I also felt that Divisadero needed that, too. So, I invited almost anyone on my street. I’d meet strangers in cars through Uber Pool and invited them over for dinner (sorry, dad!). I’d ask my friends and roommates to invite whomever they also thought would be a good fit for this misfit group. And I cooked. I cooked a lot: whole roasted fish, vegetable coconut curries, gallons of hummus, roasted miso braised chickens, paellas, and beautiful trays of Ratatouille (talk about a beautiful movie about food!). I even learned how to roast my first turkey through this process. I’ve written about my love for food and the power that food has in bringing people together before. I actually started this blog on the whole concept of eating my way through Asia with my friend Mary after I had graduated early from college but I didn’t yet know when I’d start working at Google. At the time when this blog commenced, I was making what left like large life decisions (like "should I work in a winery in Spain?") and stuffing my face with whatever looked new and different but appetizing. The fork in my road has always had a figurative and literal meaning in my life as I ruminate and make life choices while finding ways to feed and eat with my community along the way. "This isn’t a guide on how to bribe people with food to be your friends but rather how to use food as a bridge between cultures, languages, and differences of all kinds." So how to make friends using food? First and foremost, I want to preface that one should never feel that a friendship should be built on monetary or superficial transactions. One should also never feel obligated to feed people. This isn’t a guide on how to bribe people with food to be your friends but rather how to use food as a bridge between cultures, languages, and differences of all kinds. Over this past month, my first month, in my new community in Peru, I’ve put a lot of these tips to test, and based on absolutely no scientific facts whatsoever, I promise they really work. There’s a lot of power that comes from the simple phrase “I’m hungry.” Maybe it’s because it’s so rudimentary and that we rarely hear someone past the age of five proclaim it so boldly. “I’m hungry” - it sort of catches people off guard. Telling people your hungry indicates a certain level of trust and openness. When we tell a new potential friend that we’re hungry, we are telling them we need something, something basic necessary to our survival and their survival, and we are inviting them to share a meal with us if not just to point us in the right direction. This simple phrase invites vulnerability and opens the door to connecting over food. If you’re learning a new language and find yourself in a new, foreign community, I recommend you learn how to say “I’m hungry” and “I’m full.” The latter is obviously for after you finish a meal. People get a kick out of hearing “I’m full.” In Spanish it’s “me llené,” and my coworkers take so much pride when I proclaim I’m full after they’ve brought me to a new restaurant or have introduced a new dish to me. “I’m full” - It’s a proclamation of contentedness and basically giving thanks to whoever you’re eating with and the food itself. We all know people like to talk about themselves, but sometimes it can be difficult for people to divulge sensitive details about their lives if we don’t have that trust built. Confianza or trust is so important here in Peru as most people can be quite reserved when you initially meet them. “What do you like to do in your free time?” “Where did you grow up or what was your childhood like?” “How did you get into the line of work that you’re doing?” These are all fine and common questions, but they can be more invasive than we sometimes think. Starting off with what’s your favorite food or favorite food from your culture invites a story that generally most people will be happy to share. If you also happen to know a little bit about the culture that person is coming from and are acquainted with some of those traditional dishes, you’ll earn special brownie points. Peru has a very big culture around food, and within the country there are regional pride battles when it comes to food. Not only do cooking styles differ around the country, but the raw resources available in each region depend on the climate and environment. The sierras like Cusco, Ancash, and Cajamarca have more hot or roasted foods - typically meats like pollo a la brasa and lots of pork can be found. A speciality dish is cuy which is guinea pig and is a favorite of some Peruvians. 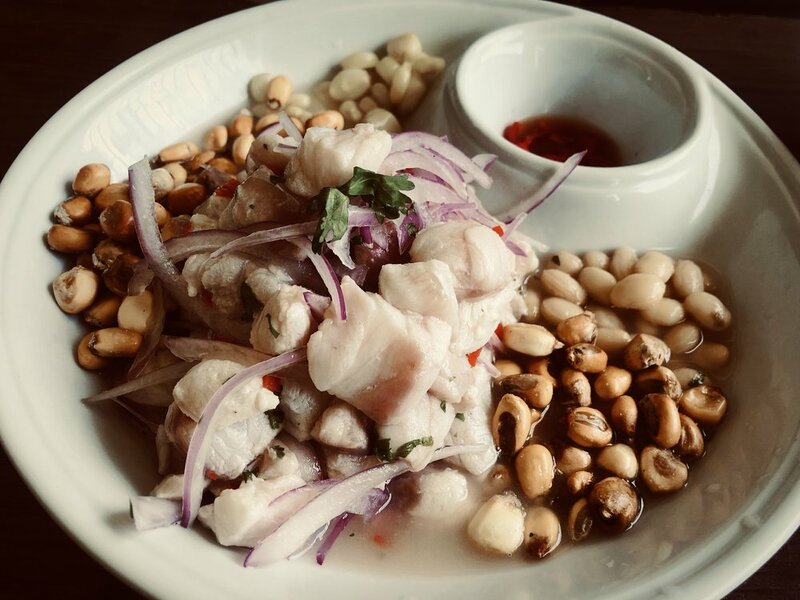 The Peruvian coast of course is known to have more fish specialties. In my region, Piura, fish is prepared in all sorts of ways. Of course there is ceviche, but there is also tiradito (sashimi like fish coated with aji), sudado (fish stew which for me is reminiscent of the traditional Filipino dish sinigang), chicharrones (breaded and fried, small pieces of fish), and cachema (fried butterflied fish). I’ve heard that fish dishes in my region are better than the fish they prepare in the jungle because we have fresh fish from the ocean whereas the jungle fish are caught from the rivers. I haven’t yet been to the jungles of Peru, but I’m planning to go soon because we have two Peace Corps Response volunteers there as well. I’ve also heard that the jungle food is very unique and one of the cooking styles is similar to a popular cooking technique in the Philippines where they cook or steam food wrapped in banana leaves. Okay, I know that this is a very controversial tip, and it’s not always possible due to dietary, health, or religious reasons. Half my friends in San Francisco are pescatarian or vegetarian which is partly why I made so many vegetable coconut curries for those Sunday neighborhood dinners. Many parts of the world, like the United States, are incredibly aware and accommodating to the spectrum of food preferences and diets. We have dairy free ice cream, gluten free pasta, and the highly revered Impossible Burger among many other innovations created to suit the culinary needs of the people. It’s amazing, but it’s also an incredibly blessed and fortunate position. If you’re in the United States and you’re having dinner at a friend’s house, then chances are you’ll be fine regardless what food preferences or restrictions you have. However there are many parts of the world (and within the United States as well), that don’t yet meet that level of Californian, free range, farm raised, dietary progressiveness some are accustomed to. Yes, sometimes meat (like pork) and carbs (like rice) are the majority of people’s diets in other countries or cultures, but sometimes this isn’t a choice: it can be a way to survive, feed their families, and be part of long-standing traditions we don't know anything about. Yet the cooking techniques that people from heavy meat and carb cultures have learned and utilize to prepare these rather basic staples can be incredible! Despite the lack of resources or ingredients, don’t underestimate those who cook with an abundance of love, skill, and pride. If someone offers you food (within or outside of the United States), be very careful before you make judgements or criticisms of the food, the person, or the culture they are coming from. If you can try the food that someone prepares for you, then try it. But if you can’t, just politely- very politely- decline, maybe explain a little why you must decline, and maybe come prepared with your own food as some of my friends back in San Francisco did so gracefully on ocassion. But never, ever host any judgements on the food or the person or culture offering you food. Sometimes food can be scarce or expensive, and the task of putting food on the table, let alone offering it to a stranger, can be a challenge. Even if you can’t or don’t want to eat what’s presented, graciously acknowledge and accept the kindness that is being offered. Don’t be thwarted from making friends with people who may give you a strange look because you can’t eat or don’t like their food… my next tip will help you navigate this. I know I said you’re not obligated to feed or cook for others, and you’re not! But how awesome is it to be able to invite friends, old and new, over for dinner and share your love for them in a nourishing form? My love for cooking was developed by my father, but my love for feeding others probably stemmed from my mother. While my dad is the ultimate party host, my mom always had this uncanny talent of welcoming anyone into our home and making them feel part of the family. I guess at the end of the day, it wasn’t really about the food, but her compassion and empathy for others, and her unending desire to make you comfortable in our kitchen. If you do have the ability to host people in your home and even just offer them bread, I really recommend it. Sometimes the nourishing part of the meal is just the company you give. If you can learn how to cook or do know how to cook, take the opportunity to share your favorite dishes with others. Especially if you have a dietary, religious, or health restriction, this is an amazing opportunity to extend a level of kindness and educate others on the delicious sorts of foods you like to or can eat. One of my best friends in San Francisco is pescaterian, and some of my most favorite meals were with her in her kitchen. I loved that I got to learn about new, healthy recipes and how to use nutritional yeast to give dishes a cheesy texture, but I also loved her obvious desire to feed me, take care of me, and nourish me with the food she knew to prepare. "Sometimes the nourishing part of the meal is just the company you give." Another reason why I used to cook so many vegetable coconut curries is because it’s pretty minimal effort and very, very cheap to make. A 1 lb. bag or bundle of carrots (in the United States) can generally be found around a dollar, and generally a pound of vegetables can serve four people. My coconut vegetable curry recipe usually includes two pounds of carrots ($2), a pound of potatoes (less than $1), and two pounds of whatever vegetables are on sale at the store or market that day ($3) mixed with curry powder, spices, a whole bulb of garlic (less than $1), and a can or two of coconut milk ($3-5). This simple concoction served alongside rice (6 uncooked cups and roughly $2) can feed more than 20 people for as little as $12. I started buying coconut milk and rice in bulk since they have a long shelf life anyway which brought costs down even more. And I started to learn little techniques that would help me achieve the best taste with my basic ingredients like sautéing my curry powder and spice in oil first or whole roasting my garlic before making my curry paste. After I learned that I could feed more than 20 people with $12, it was hard for me to buy a salad and drink for $12 during my lunch hour that I would end up eating quickly and mindlessly. There are so many great and easy recipes that can help us save money while nourishing our lives in so many ways. "Obviously, while food is a means for nutrition and fuel for the body, it is without a doubt a social activity, many times a tradition, that creates or continues relationships, celebrates events, and comforts the soul." Food transcends barriers and can nourish our lives as it nourishes our bodies if we let it. It brings people together. It’s a luxury that sometimes we forget. It’s an art form we all take pride in when we learn to master it. It’s a gift and kindness whenever we share it. It’s something that makes us really, really happy when it tastes good. Food is a reminder that we’re all human and we’re all much more similar than we sometimes think.